Oct. 7, 2015: Madeline Bassnett, Western prof.
Nov. 4, 2015: Charles Mountford, a Stratford poet and humourist. Apr. 6, 2016: Steven McCabe, a Toronto poet. May 2016: Indigenous performers: poets and others, including Charmaine E. Elijah (organizer), aboriginal historian David D. Plain (also story teller and poet), poet Gloria Alvernaz Mulcahy, as well as other possible performers including musicians and indigenous language speakers. June 2016: Lynn Tait, of Sarnia. The unexpected always happens at our London Open Mic events. Often it's only noticed by some in the room. Not this time. The Feb. 3rd, 2016 open mic could be described as a balanced world. The way winter balances summer. It began and ended quite happily, the bees in the flowers, the birds in the trees, but briefly a blizzard bore down on everyone. The three Western students, who together formed our feature presentation, were excellent. They so impressed their audience that it became obvious to organizers that full-scale feature poets will emerge from this trio in future. They were Helen Ngo, who is the current Student-Writer-in-Residence at Western, and two fellow students whom she invited, Robyn Obermeyer and Tom Ruess. This is the second season we have featured three Western students (the previous was two seasons ago). It has been such a success and so enjoyed by both the audience and the students that in future it will be a regular yearly event. The Student Writer-in-Residence Program at Western is unique in North America. It was developed here in 2013 by the University Students’ Council and the Department of English and Writing Studies. The mandate of the program is to provide support for an accomplished undergraduate writer while allowing other students to benefit from that writer’s creativity, expertise, and organizational skills. The SWIR fosters exchange among aspiring student writers and contributes to the culture of creativity across campus, within the London area (which is where London Open Mic comes in), and across literary genres, media, and technologies. The February open mic section was once again a tribute to the diversity of poetry genres, styles, the many variations on reading aloud, and of course, and especially, a tribute to the extremely diverse population of human beings which constitutes the poetry community. That diversity could not possibly show its face in a more extreme or obvious way than it did when yours truly, Organizer Stan, a formerly very shy, and currently semi-shy poet, read his soft "Moccasin Bells" midway through the open mic. It was immediately followed by an extremely loud reading, read as if this were a heavy metal concert. The speaker plug was pulled however, frayed nerves relaxed once again, and on we went. Most of our initial audience of 42 had steeled themselves through the rough bit and now sat back, glass in hand. Spring had arrived. 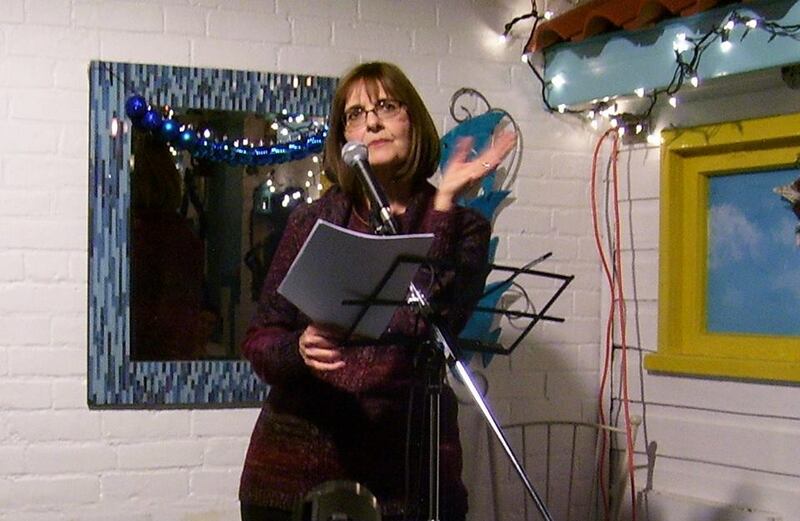 Featured poet Peggy Roffy’s warm personality probably had as much impact on the Dec. 2nd London Open Mic as did her very affecting poems. Many in the audience of fourty six had come expressly to hear her read. And the liveliness she engendered carried over into the open mic section as a remarkably varied group of readers, even by London Open Mic’s own standards, moved the audience through all the colours of their emotions. 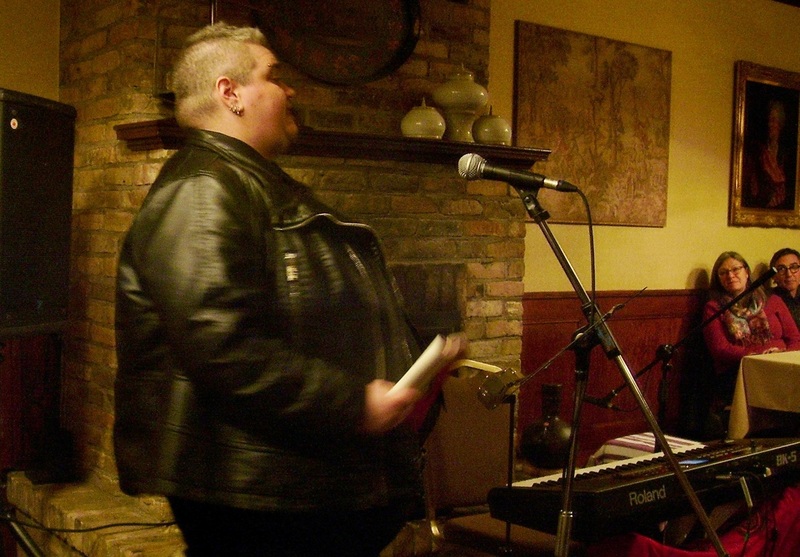 Our special Nov. 7th, 2015 open mic at the Marienbad Restaurant in downtown London, as part of the WordsFest of Literary and Creative Arts, was expected to be fairly full, but not this packed. I stopped counting at 80, but the total was probably about 90!! More chairs had to be brought up to the 2nd-floor Fireplace Room, but even then some people were standing at the back. Whoever heard of such a large gathering of poetry lovers! Many of those in attendance had walked over from the museum, which ended its last Words event of the day just before ours began. After focussing for hours on serious poetry, most only wanted to relax. The readers’ poems began to reflect that, some putting away their more arty works and bringing out their raunch and humour. The laughter at times was quite loud. Unlike those attending our regular London Open Mic Poetry Nights, the majority of this audience was quite young, which presumably explains the small sum in the donation jar. Ah, yes--those carefree years of youth. I’m so old I can hardly remember mine anymore, but it’s fun to watch others tumble through theirs. Open mic readers not photographed: Shelly Harder (photographer was lost in thought), Brittany Renaud (ditto), Stan Burfield (didn't think to stop reading for a selfie), Andy McGuire (batteries died just before Andy, the last reader). At nearly every open mic, something unexpected happens, the kind of thing people carry home carefully, and talk about afterwards with a glow and a smile. This time it wasn’t one of the open mic poets, as diverse and lively as they were, many with truly amazing poetry. And it wasn’t the featured poet, Stratford’s Charles Mountford, who delivered several of his famed dramatic monologues, each describing an intriguing woman, with a delivery that was no less so. No, the unexpected treat of the evening was Gavin Stairs, who introduced Mountford. He replaced his wife Penn Kemp, who couldn’t make it due to a slow-healing torn ligament. Gavin had Penn's notes to read, but ad-libbed his way through them, to outbursts of laughter from the audience. His first words were, "I'm Penn Kemp." With that, everyone settled back and opened up to his calm and comfortable sense of humour. The November open mic split some of its usual audience with our second open mic of the month, set for only three days later (Sat. Nov. 7th at the Marienbad Restaurant, 122 Carling St downtown) at the Words Fest Literary and Creative Arts Festival. But still we managed an audience of 32, a respectable number for any poetry event. 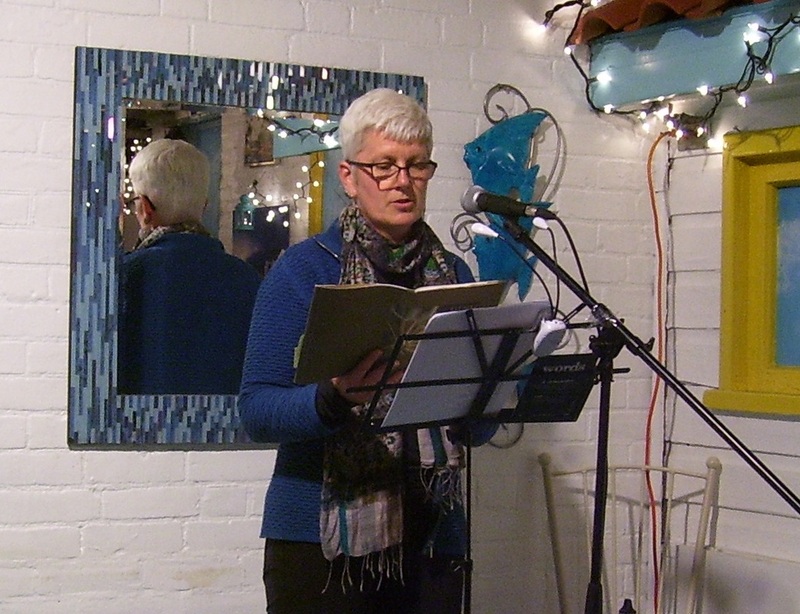 Sixteen poets read at the open mic. This summary of our October 7th, London Open Mic Poetry Night, the first in our 4th season, is tardy partly because of the flurry of new projects and ideas we are working on as an organization, most of which were described or hinted at in the introduction to the open mic. They include setting up a poetry workshop and possibly an open mic in a federal prison, a plan to have the city stamp poems into sidewalks where they’re being repaired, and helping to motivate high school English students to read and write poetry, possibly by means of a city-wide contest. The prison project just had its first, very enthusiastic meeting, and the other projects are in their initial phases. These community projects will require more people working in our organization, and those working with more people in the community. And we’ll need to have a more professional organizational structure to handle that. We have lots of work ahead of us this season. 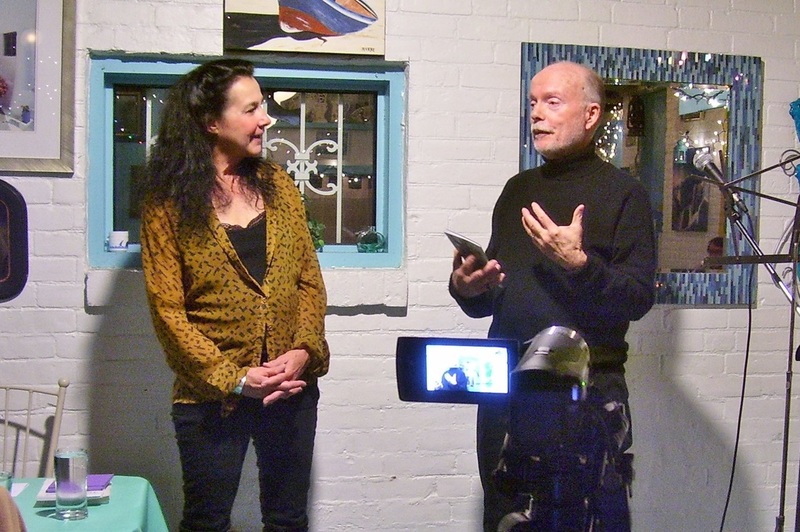 Former featured poet Tom Cull, who took the mic to introduce our October feature Madeline Bassnett, first described our coming participation in the WORDS Literary and Creative Arts Festival, which he co-organises. It will consist of our second November open mic, this one on the 7th at the Marienbad Restaurant, 8 pm, following our regular Mykonos open mic on Nov. 4th.